Isaac Walker was the eldest son of James and Catherine Walker. He was born in Charlemont, County Armagh about 1891. The family lived in Clonmain, Tullyroan, Armagh. Clonmain is about 2 miles south east of the Moy. Isaac worked in the local mill before enlisting in Dungannon. 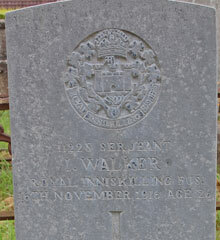 Sergeant Isaac Walker served with the 9th Battalion of the Royal Inniskilling Fusiliers. Sergeant Isaac Walker died at home on 16 November 1916. He was buried in Loughgall Old Churchyard.